292 – Rather than reducing service to SF to peak hours only, an option that should be included is to cut service to SF during night hours only, and keep the midday service (and weekend daytime service). I have seen some well utilized trips to and from SF on the weekends. Some tourists from airport hotels also take the 292 to get to San Francisco. KX – During off peak hours, KX should serve San Bruno BART north of the airport, rather than ending the route at the airport. It is rather expensive to transfer to and from BART at SFO given the $4.00 surcharge. 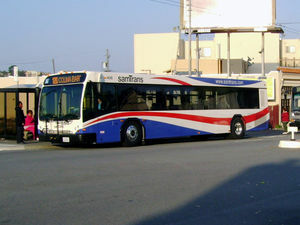 The San Bruno location also allows riders to transfer to El Camino buses. KX could be operated as a limited stop service along the remaining portion of El Camino (with stops every 1/2 to 1 mile). With the increase in ECR local service, the value of KX on El Camino is reduced. Running as a limited stop service would provide a service differentiation to attract riders. It would also be an initial step toward a possible BRT on El Camino. 251 only runs 6 days a week (the shopping center opens everyday). The line 251 alignment (even under the current plan) is still a more roundabout way to get to the shopping center, especially from points north. 294 – There should be school day or peak hour trippers along Highway 1 operated as an extension of 294. It is clear that there’s not enough vehicles on line 17, nor enough capacity on line 17 buses for certain trips. If it is operated as an extension of 294, it could have a slightly different routing suitable for larger buses. I think at least one round trip to and from Pacifica (1 AM and 1 PM) is justified. San Carlos service – Such service should include some fixed route elements during peak hours rather than a strict dial-a-ride, such as including a regular route that riders can pick up without a reservation, but can go off route up to a certain distance for people who reserved, or pick up at the train station on a regular interval without a reservation.